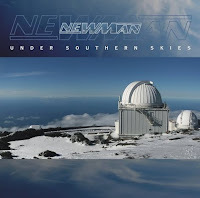 RockUnitedReviews: NEWMAN: "Under Southern Skies"
A familiar face to melodic rock lovers, Steve Newman has been a bit busier than his previous record might indicate on the solo front, with “Under Southern Skies” being his second album in as many years, following on from the very well received (and deservedly so) “The Art Of Balance”. As usual, Newman plays as many instruments as possible, although touring guitarist Shaun “Da Prawn” Bessant is allowed to contribute to one track. Not your usual AOR crooner, Newman has a voice that has a good sense of power, and is quite deep compared to any of his cotemporaries. Thankfully, he can hold a tune with the best of them, and coupled with his excellent guitar work and songwriting ability it’s rare that he releases an album of inferior quality. With this said, it’s no real surprise that “Under Southern Skies” is as solid as Jason Statham’s abs, chock full of guitar heavy melodic rock. It follows on very nicely from the last album, and if you liked that then this is really a bit of a no brainer. There’s some corking tracks, with the cream of the crop being opener “Killing Me”, power ballad “Strength To Carry On”, chorus king “Ghost In The Night” with a special mention to the haunting album closer “Monsterrat”. If anything, it’s a step up from “The Art Of Balance”, with a powerful, strong line up of beefy but melody filled tracks. “Under Southern Skies” may well be Newman at the height of his abilities, or at least until the next album. Existing fans will love it, and it’s definitely too good not to pick up plenty of new ones. Both familiar and uniquely Newmanesque, this is AOR with an edge that doesn’t come about often enough.